"My mother originally made these in her culinary arts class in high school in 1975 and they were made with lemon. I love the lemon but I wanted to make these and realized I didn't have any lemons so I used what I did have, grapefruit. They turned out wonderful! I bet they would be good made with oranges too. 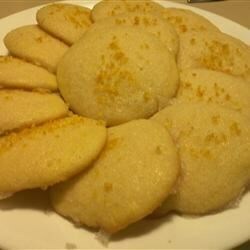 The glaze is different from your regular iced cookie with the granulated sugar giving a nice texture on top. Yummy!" Preheat oven to 350 degrees F (175 degrees C). Whisk flour, baking soda, and salt together in a bowl. Mix 1 1/2 teaspoon of grapefruit juice into milk in a small bowl, and set aside for about 5 minutes. In a large bowl, mash the butter with 3/4 cup of sugar until creamy and well combined, and beat in the egg and grapefruit zest until thoroughly combined. Beat the milk into the butter mixture about 2 tablespoons at a time, alternating with the flour mixture, until the dough is smooth. Drop by teaspoons onto ungreased baking sheets, about 2 inches apart. Bake in the preheated oven until set and very lightly browned, 12 to 14 minutes. Cool on racks. Make glaze by mixing 3/4 cup sugar with 1/4 cup grapefruit juice. Brush glaze onto cooled cookies; let stand until glaze is set. These were delicious! I had to bake them at 325 because my oven runs hotter than normal, but great recipe! These taste good. I don't like the texture of the icing, in the future, I'll use powdered sugar instead of white. Very moist, light cookies! I used powder sugar instead of gradulated. They disappeared fast!! Really good! I mixed some powdered sugar with the granulated sugar to make the glaze a little thicker.